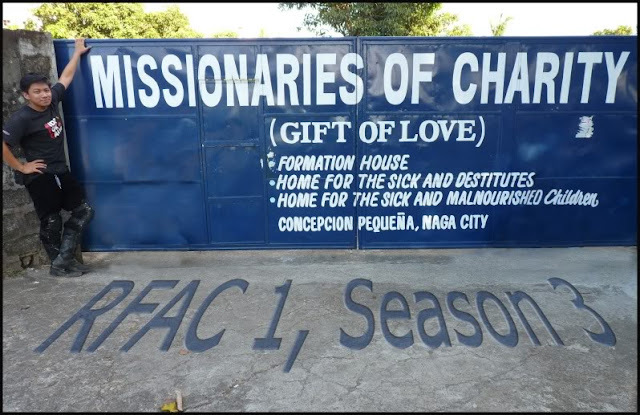 One move and an act of love that I commit myself to do before the year ends is to visit "Gift of Love" again in Naga City. When I was still in college, my friends and I usually visit the kids at the Gift of Love orphanage in Naga. Gift of love is a children’s shelter under the care of the Missionaries of Charity. Founded by Mother Teresa of Calcutta, the sisters care for abandoned children, sick children, the mentally ill, ex-prostitutes, lepers, AIDS victims, refugees, the aged, and convalescent. A friend even entered their congregation and studied to be a nun and we even visited her at Gift of Love. Unlike other kids during our time, I rarely go to disco or gimmicks, I usually hang out with my friends in church, seminary or the orphanage. We also go to different depressed community in Naga during Sundays to help maintain a clean environment in the barangay. And give Christmas cheers to the kids in the area. We spent Sunday morning, sweeping and cleaning barangay public health offices. We also help remove rocks, grass and other dirt in the barangay premises. I was a catechist and a Campus Ministry at the same time, so it was not easy for a college kid like me to schedule a visit to the Gift of love. Aside from the gift of love which we frequent, we also do Christmas cheers in depressed areas in Naga like in Mabulo, where, each one of us adopt one kid per family, then feed, bath, buy toys for them for a day. Yes, only for a day because we're only college kids back then. He was so fragile. Very tiny baby. My friends and I are not allowed to carry him because he was under medication and has a Intravenous Solution attached to his fragile body. Some of us shed tears, we can't help it. It was heart wrenching. It definitely leaves a lump in one’s throat. After that visit, we got so busy with school and other activities. I was never able to keep track what happened to that little angel. Many years had passed by already but the image of his fragile body was forever etched in my memory. If I will be presented with an opportunity I would really like to visit the Gift of love and once again give some cheers to the children. I am still recovering from my ailment but today, I resolved to visit the Gift of Love orphanage before the year ends. Source of Gift of Love pix: motorcycle phil.